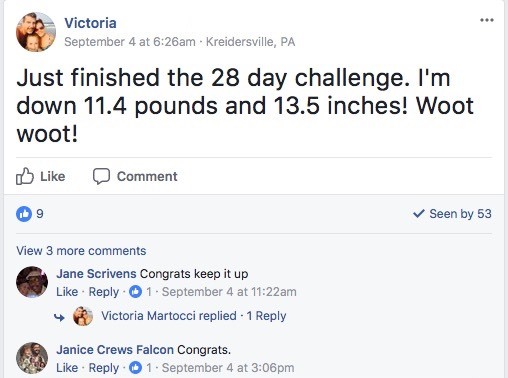 On your quest to losing weight or getting the body that you want there are bound to be some hiccups. I live in Las Vegas so there are a lot of hiccups. The problem isn’t the hiccup yourself. The problem is the hiccups that follow. One beer can lead to 5 days of caring less about what you eat. This leads to your body feeling worse than you remember. It’s groggy, lethargic, and in general just doesn’t feel as powerful as it should. This 24-hour detox method will help your body feel like you successfully pushed the restart button and help you towards staying on track. For this plan, we aren’t going to give you the exact times you should do each step because everyone’s schedule is different. Instead, we will focus on an event or time of day. You are going to start a mini-fast. The goal is to wait at least 12 hours since you last ate. Because fasting can reset your metabolism and make your body decide that it’s probably time to start burning off any extra glucose that has been added during your bad days. 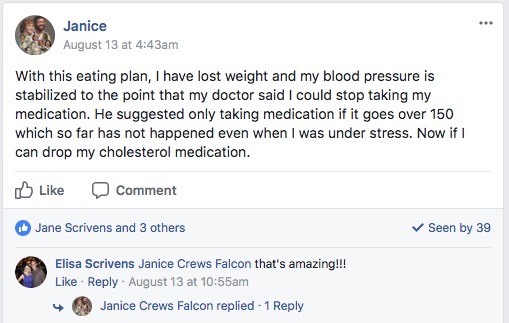 If you want, you can do a more aggressive fasting routine, but most people (people that know about diets, the body, and health) agree that 12 hours without food is enough to put your body in a fasted state. Most people’s morning routine involves minimum movement as they go about their day getting ready. Taking a step outside to go for a nice and brisk walk has a number of benefits. Because you didn’t refuel your body with a fresh bowl of Frosted Flakes, your body will need to burn something to produce energy. Can you guess what it will start working on? When you are in your fasted state the energy you burn comes right from your fat stores instead of any hidden glucose that still might be in your system. Fun Fact: did you know that exercising in a fasted state can burn almost 20& more fat compared to exercising with fuel in the tank? True story. Something else magical happens when you go for a walk in the morning. The UV rays produced by the Sun between 8am-12pm reduce your risks of weight gain. There are only guesses as to why this is, but the most popular theory is that the light syncs your metabolism and helps to undercut your fat genes. Whether this is true or not it really doesn’t matter because walking and sunshine (in moderate amounts) is really good for you so go do it anyways. One of the secrets to losing weight is to drink water. This is double true for those of us who like to consume the bubbly from time to time. If you are someone that likes to eat a lot of salty foods (really abundant around the holidays) you will find that they can leave you dehydrated and bloated. Why do you feel bloated? Science time! Both alcohol and salt put your kidney out of whack because they have a weird anti-diuretic effect that controls the hormones in the kidney. This chemical is important because it controls how much you urinate. You end up peeing more frequently and when your body notices this it decides to try and hold on to as much as it can. This is why you end up feeling bloated. To counter this start getting water back into your body as soon as possible. But not just any type of water. Get some citrus fruit (lemons and oranges) into your water so that you can start to take advantage of their natural detoxifying benefits. Citrus fruits are very high in anti-oxidants. One of them helps to stimulate liver enzymes that help to flush out toxins from the body. Assuming it’s been 12 hours since you last ate (you aren’t midnight snacking are you?) you get to now enjoy a banana smoothie. Throw a banana into the blender (please peel it first), add in some non-dairy milk (we love almond milk) and a scoop of your favorite protein powder. Press blend or whatever blenders say and you are good to go. The reason why you are using bananas is that they contain a good amount of vitamin B6. This beautiful, beautiful vitamin is awesome because it can help to reduce hangover effects by up to 50%!!! Also, because you are peeing a lot they help to replenish your body of the potassium that it has lost. That is why you are going to have a protein-packed lunch with asparagus. Asparagus has the amino acids and minerals that aid in doing all of the wonderful things listed above. You want a protein-packed lunch because the protein is going to give you more vitamin B6 (we love this stuff) and amino acids that helps to cure the grogginess of a hangover. Tea is always good for you, but for this detox plan you are going to want some red ginseng tea. Why? Red ginseng tea has been show to greatly reduce plasma alcohol levels. The worst part about all of this? I hate the taste of tea so unfortunately, I have to skip this step. It works well for my wife though who is a tea fanatic. Next to drinking tea this is the hardest step for me because I love naps. If you still feel bloated and gassy one of the worst things that you can do is take a nap. Being upright, sitting or standing, is more effective in reducing intestinal gas retention. Who knew that your posture would play such a big role in how easily gas moves through your system? Your best counter to being sleep is to go out and take another walk. Yes. Two walks in a day. You’ll survive. Wanting to snack on something is inevitable, but you don’t want to reverse all of the good work you’ve done so far today. So what you need is a snack that is good for you and continues to improve your progress for today. What you are looking for are blueberries. Blueberries are packed with something weird called pterostilbene. Studies have shown that higer doses of pterostilbene help in reducing cholesterol and glucose. If you want to ignore all of that and just eat them because they are delicious then I don’t blame you. Munch away. Yoga is a great way to relieve stress and you’ve had a stressful day. You’ve been fighting through aches, pains, and other bad things so you need something that will help to guarantee a good night’s sleep. Yoga is so awesome that it has been shown to help banish insomnia just as well as sleeping pills. Don’t read on the phone and then suddenly put it down thinking you are going to fall asleep quickly. It has been shown that the blue light from phones gets the brain hyped up causing it to become more difficult to sleep at night. Pick a decent time to go to bed and put your phone away 30 minutes prior. A good night sleep is what you need to complete this day of recovery and reboot. 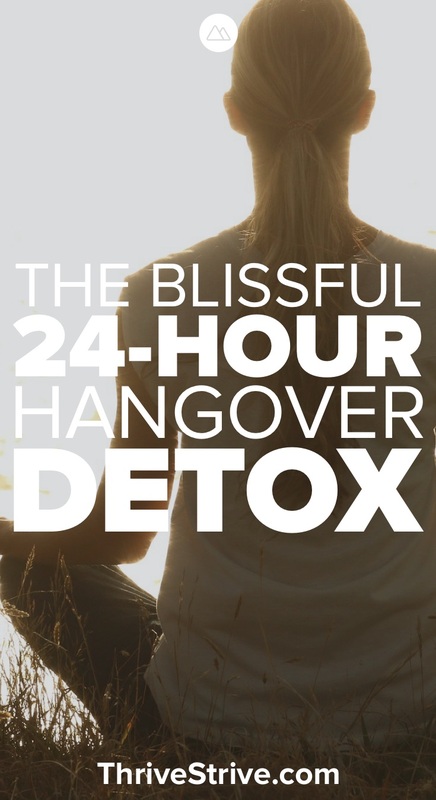 Enjoyed The Blissful 24-Hour Hangover Detox? Share it with your friends so they to can follow the Thrive/Strive journey.